Umayyad Dynasty. There were two. The eastern dynasty (661-750) was the first great Muslim rulers to govern the Empire of the Caliphate. When it reached its height, the capital was in Damascus and the territory included Persia, Syria, Egypt, Saudi Arabia, North Africa, Spain and other parts of central Asia. The eastern dynasty was responsible for first invasions in Spain, France and India among others. 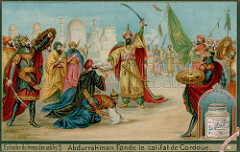 Following their defeat in 750 by the Abbasids (who moved the capital to Baghdad), ‘Abd ar Rahman, the only surviving prince, escaped and fled to Cordova where he founded the second dynasty and became the emir of Spain in 756. For this Spanish cuisine is peppered with as many or more recipes with Persian roots or names than those with other Arabic origins. While the rest of Europe was living in hovels, the caliphate reached its peak of splendor between 822 and 852. While Paris had a population of 40,000, Cordova, the western Umayyad capital, was the largest city in Europe with a population of half a million. Too, it was the most cultured city in Europe with a university by the 9th C. It had numerous free schools, vast libraries, street lights, paved streets, over 1,000 mosques, some 900 public baths, a sewage system, and an intricate irrigation system. Cordovans had a system of etiquette and manners, see Ziryab. 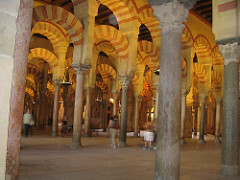 In 929, Abd ar-Rahman III made it a caliphate. The dynasty fell in 1031 to the Jahwarid Dynasty and Cordova ebbed out of its role as international leaders with a succession of different conquering dynasties and rulers until Ferdinand III of Castile (1217-1252) defeated those in Cordova in 1236.
including fish, meatballs, lamb sausages or fried tripe, guts, intestines and bowels. split almonds, not almond milk but few recipes call for them. Beware of Cats - This is so good! Scale large fish, cut up and boil; then wash and remove skin. Put it in a tajine or a pot and cover with mint juice, fresh cilantro juice and onion juice, pepper, coriander seed, ginger and caraway to taste. Simmer, stirring occasionally, until fish is tender. Add water as necessary to prevent sticking. Pour in oil. Add fennel. Reduce broth and remove from heat. Let stand 10 minutes. Remove fish from the broth, grind and make meatballs. 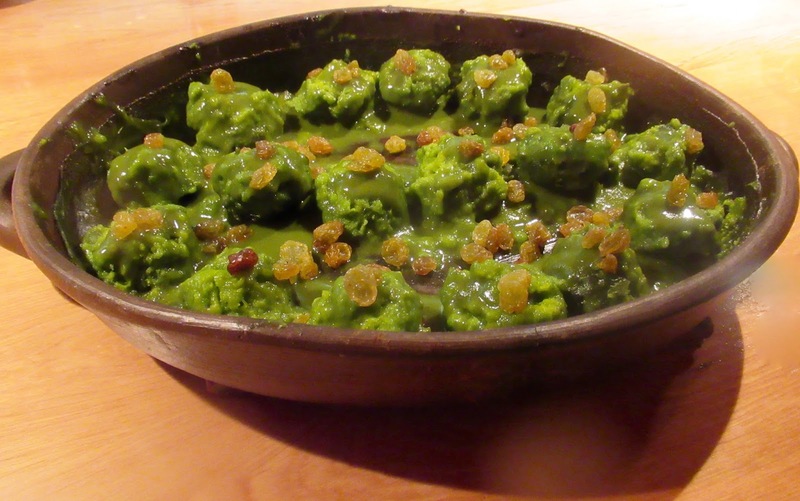 Place the meatballs in an ovenproof dish. Pour broth over them and heat until sauce reduces and thickens.